← CoCo Fresh Tea & Juice Supports SickKids in the Six! 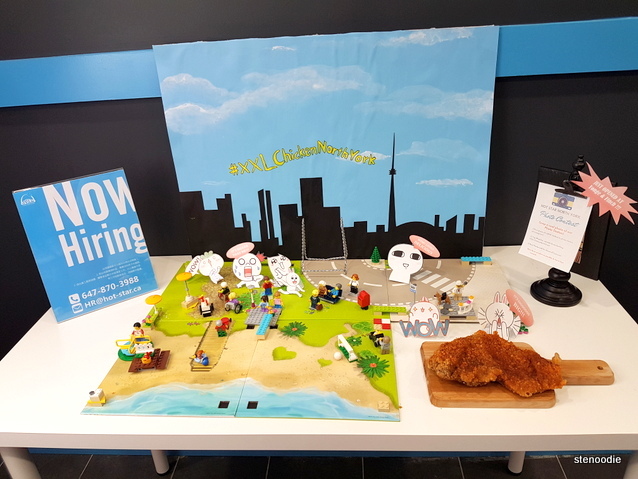 Taiwan’s #1 XXL Fried Chicken is NOW OPEN in North York! Thanks to Sweven Media who provided me with a free voucher of a piece of their large fried chicken, I visited the North York location to redeem it last Saturday after our visit to the Coco Fresh Tea & Juice (also at Yonge and Finch). 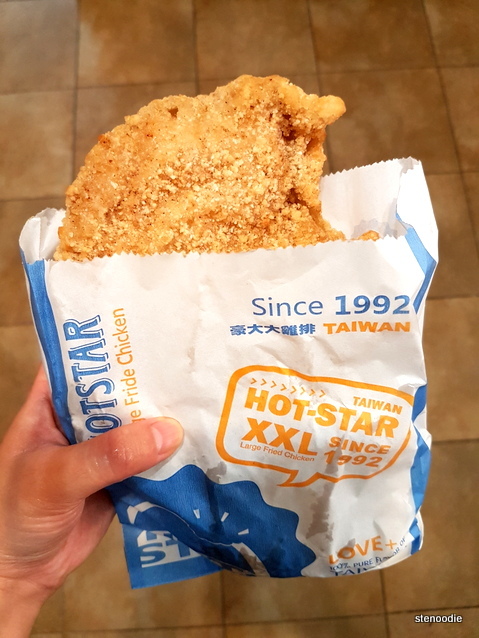 Hot-Star Large Fried Chicken comes from Taiwan and has dozens of franchised locations all over the world including United States, Australia, Thailand, China, Malaysia, and Singapore. 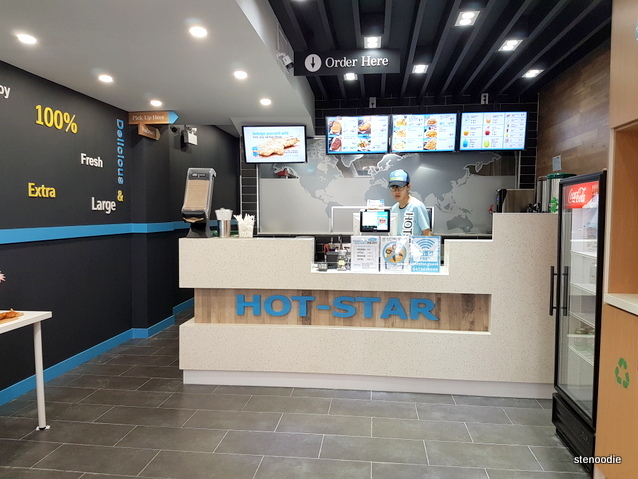 Hot-Star Large Fried Chicken only newly arrived in Canada in 2015 with their first store in downtown Toronto. They then opened a store in Pacific Mall in Markham and recently opened their third store in North York in Toronto. (My first time trying Hot Star Large Fried Chicken was actually in Hong Kong when I was there last autumn 😀 — blogged here). 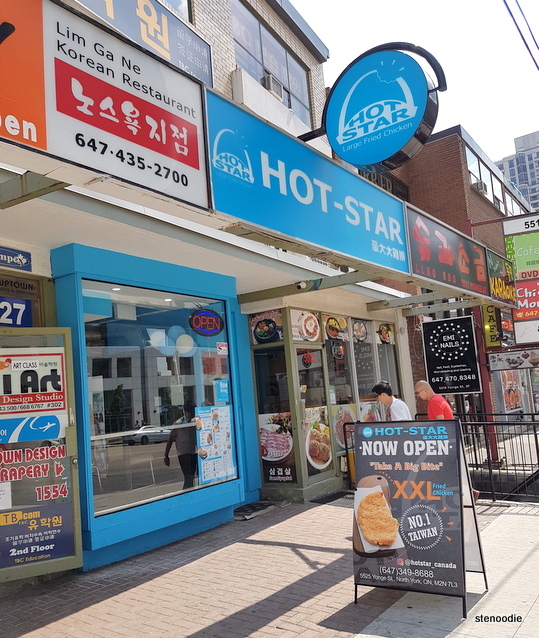 The North York store of Hot Star Large Fried Chicken is located just south of the intersection of Yonge and Finch and next to Lim Ga Ne Korean Restaurant. They have a few tables for dine-in but I gather that many of their customers actually order take-out — it must be so convenient for those living in the nearby apartments to grab a quick afternoon or late-night snack here. We redeemed the voucher for the Original Large Fried Chicken in Salt and Pepper seasoning. 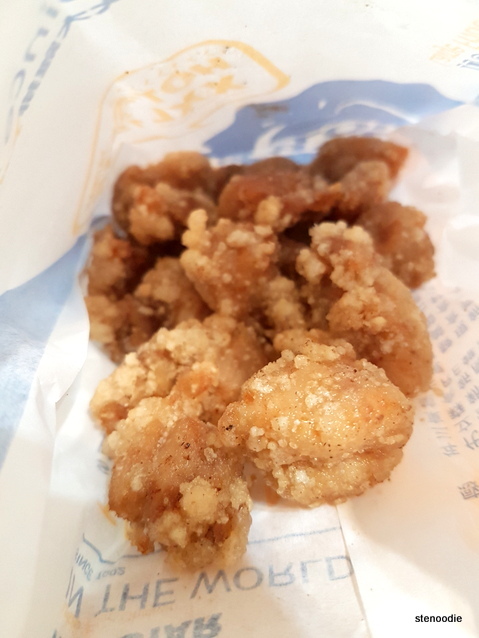 We also ordered a serving of their Popcorn Chicken (my favourite) and a serving of their Fried King Oyster Mushrooms. It did take about ten minutes for our order to be ready. It’s nice that they prepared it fresh, I guess. We brought it back to Ken’s place before we dug in. 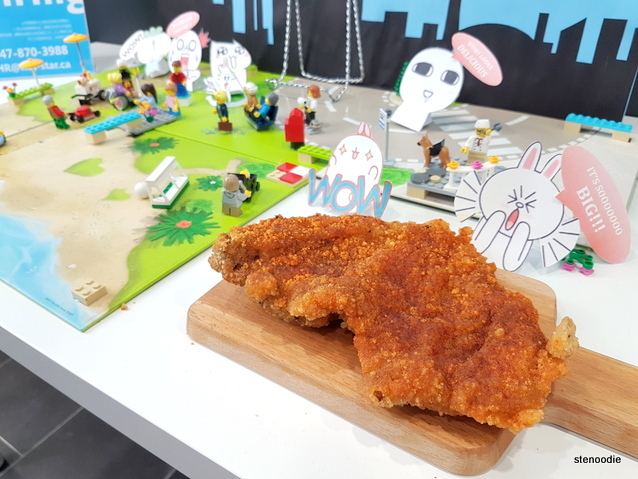 The Original Large Fried Chicken cutlet wasn’t as large as I remembered it to be when I had it in Hong Kong (and when I had it in Hong Kong, it was actually the smaller version of the Large size too). Ken was also underwhelmed with the size too. It was still crispy though when we ate it. 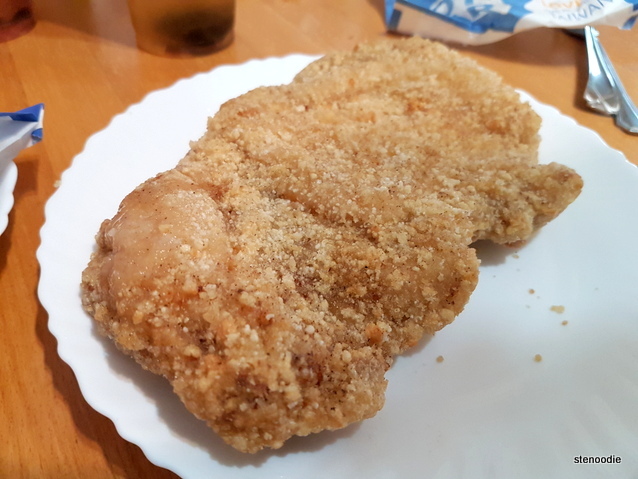 It was the same taste-wise as I remembered with the crispy battered skin falling away from the chicken breast meat, which was moist and very tender. When I ate it in my hands, it almost felt like I was eating a chicken skin-chicken meat-chicken skin sandwich. XD I still enjoyed it though because the chicken meat was moist and tender. Oh, when we got to the end part of the chicken, we realized that it wasn’t a pure piece of chicken breast; there were actually bones! They had squished the chicken so that you could see the rib cage and bones too. This was definitely different from the pure chicken meat cutlet that I had had in Hong Kong. 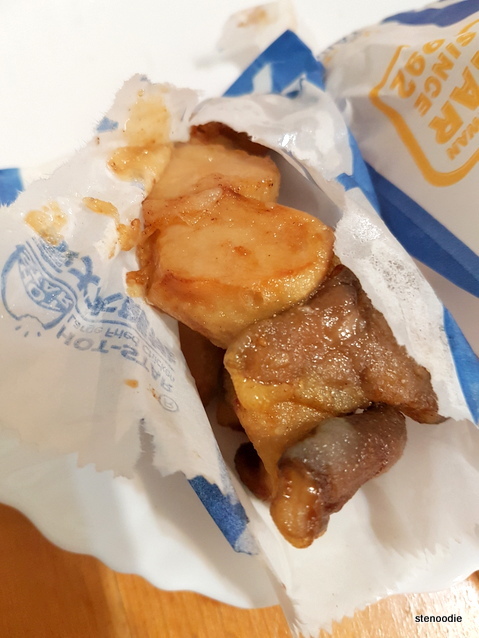 The Popcorn Chicken serving cost $6.99 and for that price, I thought that there were very few pieces inside the paper packet. Taste-wise, it was delicious. The Popcorn Chicken morsels were crispy too and seasoned heavier than the large piece of fried chicken. I really enjoyed this and the Popcorn Chicken was definitely to my liking. )I get very particular about Popcorn Chicken. :)) But when it comes to the price, I can’t see myself ordering this again for so few pieces. 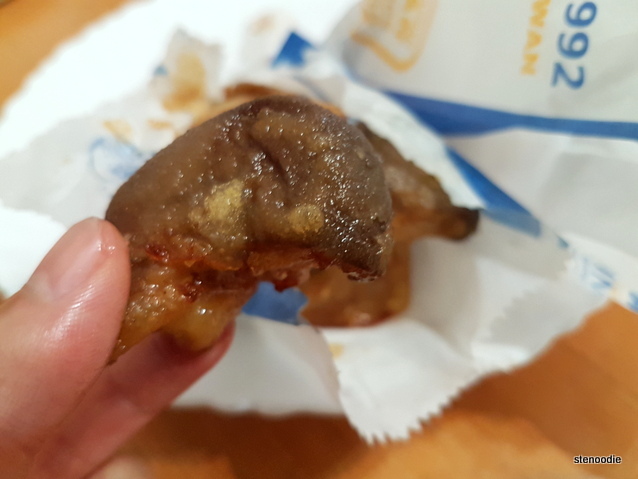 The Fried King Oyster Mushrooms were $4.99 for one serving and also didn’t contain that many pieces. I really enjoyed the taste too! The Fried King Oyster Mushrooms were cut into chunky pieces that weren’t too battered but full of seasoning. Yummy! 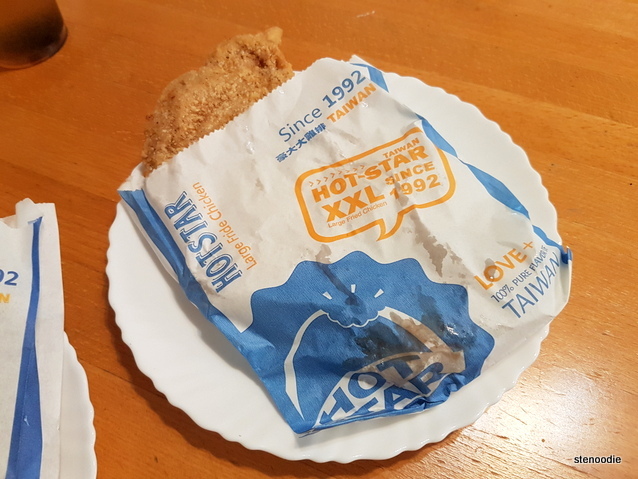 I’m really glad that I finally got to try Hot-Star Large Fried Chicken in Canada. I haven’t tried their Pacific Mall or downtown Toronto locations. If I pass by those one day, I might try those to see if they are just as underwhelming as this North York location. FTC Disclaimer: Although Hot Star Large Fried Chicken provided a complimentary item in order to promote their restaurant, the opinions expressed here represent my own and not those of the company. 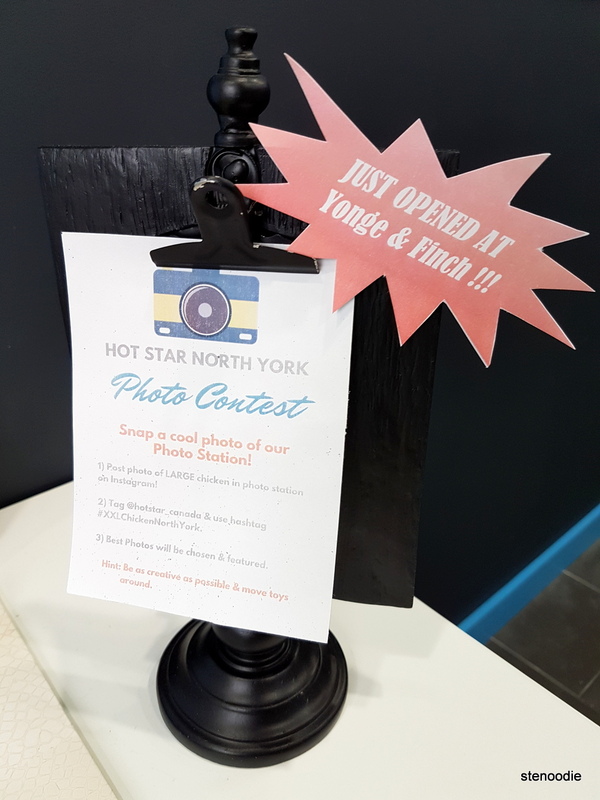 This entry was posted in Complimentary Adventures, Food and tagged #XXLChickenNorthYork, 374 Yonge St, @hotstar_canada, 豪大大雞排, Fried King Oyster Mushrooms, Hot Star Large Fried Chicken, Hot Star Large Fried Chicken cutlet, Hot Star Large Fried Chicken menu and prices, North York, Original Large Fried Chicken, Popcorn Chicken, Taiwan's #1 XXL Fried Chicken is NOW OPEN in North York, Toronto, XXL Fried Chicken. Bookmark the permalink.